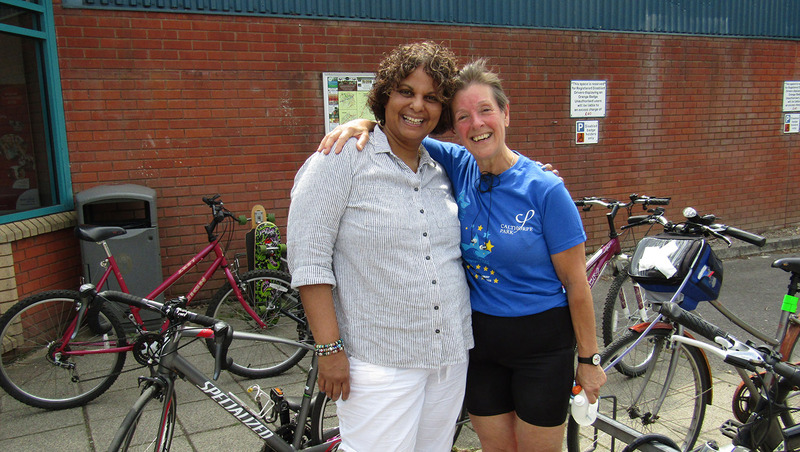 Sandra’s fundraising challenge: mission complete! I’m up, with lots of butterflies in my tummy! I head down stairs for porridge (a BIG bowl), check my bag that has a change of clothes and swimming gear – and then I also check my bike, which is packed with water, snack bars and sweets. I’m ready! I check everything again and then send a last text to friends to say I am on my way. Ocean Stars, here we go! We are off and I am feeling really good. I’m flying, nice and quiet on the roads and feeling very upbeat, (which was very different from when I did my canal walk in 2014, as in the first hour my head was full of thoughts about people who were no longer alive, which left me feeling a bit tearful), but this time I am buzzing, cruising along and enjoying it. I’m even chatting to myself (a bit worrying) and I see people thinking, “you’re just a middle aged women out for a bit of exercise”, but little did they know this was a woman on a mission! I arrive at a sort of half way point and look at my watch – 9.30 – wow, I’m speeding along! After seeing the time, in my head I am thinking if I get there earlier I could do a bit more, brave words I think! So, on I go. I get to Cricket Hill and I’m going down fast, as there are no cars. “Go for it Sandra” I tell myself in the middle of the road, grinning from ear to ear. I then remind myself that I need to watch out as the next bit goes up, up and up, so I get my peddles going and I start zooming along once again. It’s only a matter of time before the long drag starts, so I switch to a lower gear and try not to run out of gears too soon (especially as only five are working!). I am soon faced with the road from hell and the hill that just keeps going up and up the road to Alton. Lots of lorries and cars pass and I keep going in gear three for about two minutes, but then I find myself in my lowest gear – and with no more gears to help! The lorries come close, but love it or hate it; they have to crawl behind me. The pressure is on, and I am determined to show them I can get up this hill without getting off – I am a women possessed! I hope they can’t hear me, as I am really shouting at myself to get up this hill. Thankfully I can eventually see the brow of the hill and I can finally feel it getting easier – what a relief! I’m still doing good time as I reach the leisure centre – 1 hour 15 minutes – so I check in with my friend Ali, then off I go for the run with music in my ears and banana and snack bar in hand. 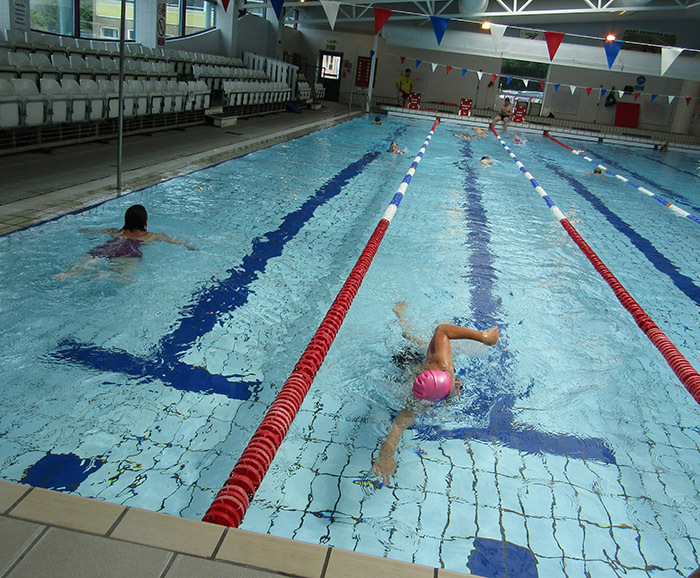 I have a quick stop off at the leisure centre, and then off I go again to finish in 55 minutes. Before I get ready to swim, Ali checks the distance gizmo and tells me I have only done 19 miles on my bike ride – and my face completely drops. I quickly decide to run an extra mile and then add an additional section onto the second bike ride, and soon feel much happier! After the run, it’s time for a swim, which Ali is doing as well – it really gives me a boost! One hour and 90 lengths later, I am feeling good, my legs are okay and my arms aren’t too tired. I change, and then like a bullet from the sky – where’s the key to the padlock on my bike?! I panic, empty my bag on the floor (dropping the distance metre in the process! ), but it’s nowhere to be seen. At this point I’m calling my husband Graham to ask him to cut the lock off, and after a few very choice words (I have been informed there are no kids around!) Ali looks at me and asks if I feel better – I say yes, at which point we both look up and see my key hanging on my helmet! We laugh, but I have wasted 20 minutes, so it’s time to go. Right, it’s now time for the next run. I am pumped and I run like the wind, only walking three times for the count of 100. 50 minutes later and I am coming across the car park and there are two angels (my friends) coming out of the leisure centre – they see me and my heart sings. We have a few big hugs and photos and them I’m off for my next swim. My friends Dilanee (who also runs Ocean Stars) and Maureen are on the pool side with big smiles and off I go. After doing the 90 lengths I feel tired, but still positive. 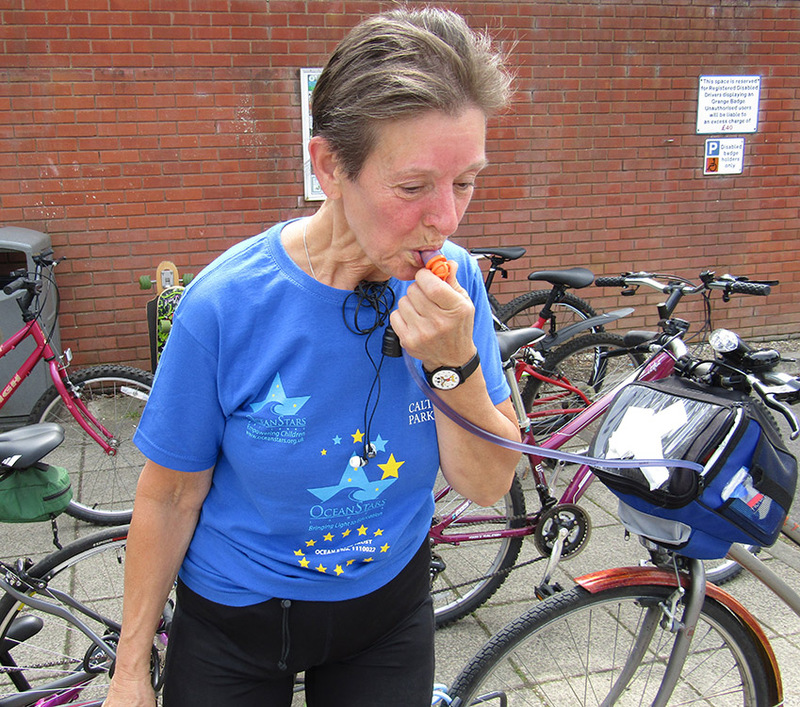 I soon stuffed some food in my mouth, had a quick sit down for a few minutes as I felt a little wobbly, and then off I went at 4.25pm on the second bike ride – the final stretch. My legs really don’t belong to me at this point, so this is now about endurance. I decide to try and focus on positive thoughts, reflecting on the fact that as I am doing this people are sending money to Ocean Stars Trust to raise funds for a new dormitory for an orphanage. All worthwhile, I think to myself. All of a sudden, I then hit the wall, mentally and physically. My knees are really hurting; I have a headache and I’m very, very sore! The extra two miles are now coming up and I so want to just go home, “no one will know” I think – but I will, “so get going Stokes” I tell myself, and that’s exactly what I did. I finally pull in my drive, the garage door is open and Graham, my knight in shining armour is waiting for me. Just over eight hours since I started my challenge for the Ocean Stars Trust, I can finally say… I did it! If you’d like to help support Sandra – don’t worry, there’s still time! Please visit her JustGiving page, where you can also find out a bit more about her incredible challenge and the Ocean Stars Trust. How can video help develop your brand? Help us do our bit for the poppy appeal! The story of the mighty Chiefs – and how they dared to fly! The future of VR – is this the real life, or is this just fantasy? Are advertising and marketing guidelines constricting creativity? Shine Creative achieves Elite agency status 3 years in a row! What is GDPR and how will it affect your email marketing strategy? The battle of the Christmas ads – who did it best? Love them or loathe them: are emojis here to stay? Creativity – a natural talent or nurtured skill? Josie’s Dragonfly Trust – our chosen charity for 2018! Shine achieves RAR recommendations for 25 services! Together we can make dreams come true this Christmas! Why we’re trading #PumpkinsForPounds this Halloween! Industry specialism – smart or short sighted? Shine goes on tour – with Toolbank’s Autumn Trade Shows! Can sloppy advertising be good advertising?